The city-building series returns with Caesar IV. BY DAVID ADAMS VU Games announced today it will publish Caesar IV, the latest installment in the venerable city-building strategy series. Developed by Tilted Mill Entertainment, Caesar IV will build on the core gameplay of previous Caesar titles (build up your city, rise to glory), but offer various refinements and new features, not the least of which is a fully 3D engine. In the game, you'll play a provincial governor managing an ancient Roman city and surrounding province. If you build your city right, keeping your citizens safe and happy, you have a chance to rise through political rank to become Caesar yourself. "Caesar III was a tremendous worldwide success, with this latest installment, we feel fans across the globe will once again enjoy all this series has to offer," said Bret Berry at Vivendi Universal Games. "We are all committed to ensuring that in every aspect this sequel builds on all the qualities that make the Caesar series unique." 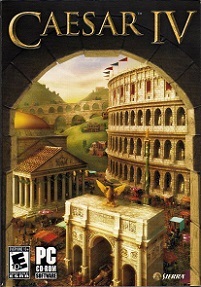 VU Games plans to publish Caesar IV under the Sierra label some time in 2006. We'll be back with even more on the title as details emerge.